The works of cowboy artists depict life on the Florida frontier. On display at the Polasek are Allegory of Work by Sean Sexton (top); Brahmans by Hobby Campbell (middle); and Riding Out Pairs by Eldon Lux (bottom). Mamas, don’t let your babies grow up to be cowboys. Memo to Willie and Waylon: Despite the best efforts of concerned mamas, plenty of babies did grow up to be cowboys. And many of them were — and are — in Florida. See for yourself at Lay of the Land: The Art of Florida’s Cattle Culture at the Albin Polasek Museum & Sculpture Gardens. But you’ll have to go at a gallop to get there, since the exhibition, presented in collaboration with the Florida Cattlemen’s Association, rides off into the sunset on Sunday, April 14. But first there’ll be a hoedown — well, a reception — on Friday, April 12, featuring entertainment by poets who’ve participated in the National Cowboy Poetry Gathering, sponsored by the Western Folklife Center in Elko, Nevada. Doors open at 6 p.m. with poetry readings beginning at 7 p.m. Admission to the event is free, but an RSVP is required. Onsite parking is $5, and there’ll be a cash bar. Email info@polasek.org to make your reservations. Lay of the Land features art and objects representing the state’s 500-year-old cattle industry. A broad range of items are on display, from handmade functional objects like saddles, whips, chaps and spurs to fine-art photography, sketches, paintings and sculpture. 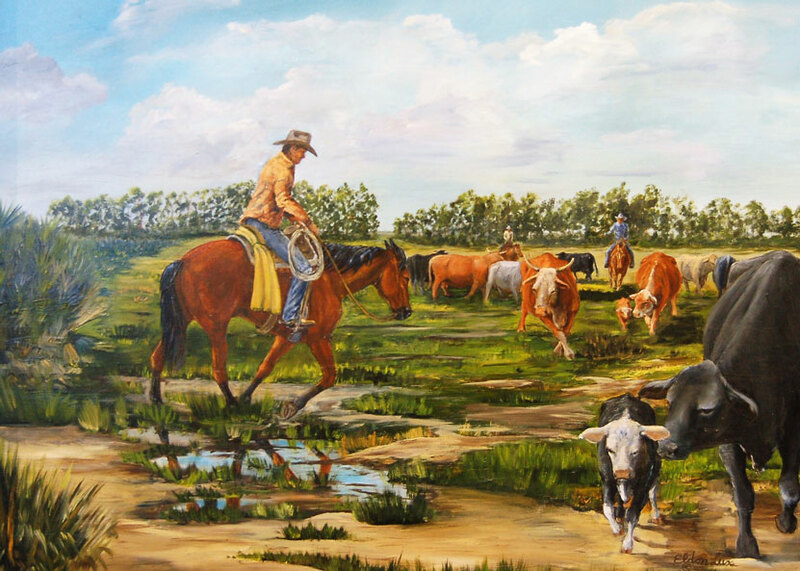 The exhibition conveys the excitement of rodeos and cattle drives and the unspoiled beauty of Florida’s native scrub land where cattle graze. Everything is on loan from members of the Cowboy Artist’s Association of Florida, cowboy craftsmen, private collectors and the Seminole Tribe of Florida. Founded in 1961, the Polasek preserves the 200-plus-piece collection of world-renowned Czech-American sculptor Albin Polasek (1871-1965). The museum, once Polasek’s home and studio, is listed on the National Register of Historic Places. The lushly landscaped grounds also encompass the renovated 1885 Capen House, which was saved from demolition, floated across Lake Osceola and renovated for use as offices and an events space in 2015. Museum members are admitted free. For non-members it’s $10 for adults, $8 for seniors (age 60 or older), $8 for college students and $3 for kindergartners through 12th graders. For more information call 407-647-6294 or visit polasek.org. The compound, which overlooks Lake Osceola, is located at 633 Osceola Avenue. Notes: The exhibition runs through Sunday, April 14. But you won’t want to miss a closing reception featuring readings by acclaimed cowboy poets on Friday, April 12 at 7 p.m. Admission to the reception is free, but reservations are required. Email RSVPs to info@polasek.org. 11th Annual Winter Park Paint-Out. The Albin Polasek Museum & Sculpture Gardens will host the eleventh annual Winter Park Paint-Out from April 21 to 27. Admission to the museum, sculpture gardens and gallery will be free to the public during the weeklong event. Twenty-five professionally acclaimed plein air artists will paint at the museum and locations throughout the city, with everyone invited to watch the artists work, view their recently completed paintings in the “wet gallery” and attend free demonstrations. A ticketed garden party will be held at the museum on April 27 from 6 to 9 p.m., where guests can meet the artists, see the entire exhibition of more than 200 paintings and — artists, in particular, love this part — purchase your favorite pieces. 633 Osceola Avenue, Winter Park. 407-647-6294. winterparkpaintout.com. Albin Polasek Museum & Sculpture Gardens. This lakeside museum, open since 1961, is dedicated to preserving the works of the famed Czech sculptor for whom it was both home and studio for more than a decade. Closing April 14 is Lay of the Land: The Art of Florida’s Cattle Culture, a collaboration with the Florida Cattlemen’s Association that showcases five centuries of art by cowboys, crackers and Native Americans. A farewell reception, slated for April 12 from 6 to 9 p.m., will feature readings by acclaimed cowboy poets. (For more, see page 86.) The museum offers tours of Polasek’s home Tuesdays through Saturdays. And it offers tours of the adjacent Capen-Showalter House three times weekly: Tuesdays and Thursdays at 11:30 a.m., and Saturdays at 10:15 a.m. The Capen-Showalter House, built in 1885, was saved from demolition several years ago and floated across Lake Osceola to its current location on the Polasek’s grounds. Admission is $10 for adults, $8 for seniors, $3 for students and free for children. 633 Osceola Avenue, Winter Park. 407-647-6294. polasek.org. Art & History Museums — Maitland. The Maitland Art Center, one of five museums anchoring the city’s Cultural Corridor, was founded as an art colony in 1937 by visionary American artist and architect J. André Smith. The center, located at 231 West Packwood Avenue, Maitland, is the Orlando area’s only National Historic Landmark and one of the few surviving examples of Mayan Revival architecture in the Southeast. Continuing through May 12 are two related exhibitions in two venues: Maitland and African-American Experiences Then & Now: J. André Smith and Jane Turner at the Maitland Art Center and Maitland and African-American Experiences: Marked, Unmarked, Remembered at the Maitland Historical Museum & Telephone Museum. Both run through May 12. (For more, see page 58.) On display from June 2 through September 11 is Pressed Editions: Experimental Contemporary Prints, which showcases works by Central Florida printmakers, including prints made with experimental processes of traditional techniques and unconventional handling of materials. J. André Smith’s printing press and some of his etching plates will be also on view. Admission to the art center’s galleries is $6 for adults, $5 for seniors and students (ages 5 to 17) and free for children age 4 and under. Maitland residents receive a $1 discount. The Cultural Corridor also includes the Carpentry Shop Museum, located with the Waterhouse Residence at 820 Lake Lily Drive, Maitland. 407-539-2181. artandhistory.org. Charles Hosmer Morse Museum of American Art. With more than 19,000 square feet of gallery and public space, the Morse houses the world’s most important collection of Louis Comfort Tiffany creations, including jewelry, pottery, paintings, art glass and an entire chapel interior originally designed and built for the 1893 World’s Columbian Exposition in Chicago. Ongoing through September 2020 is a major exhibition, Earth into Art — The Flowering of American Art Pottery. The displayed objects, which date from the 1870s to the early 1900s, are drawn from the museum’s collection of American art pottery — one of the largest such collections in the U.S. Admission is $6 for adults, $5 for seniors, $1 for students and free for children younger than age 12. On Fridays through April 26, gallery admission is free from 4 p.m. to 8 p.m., with live music starting at 5 p.m. Admission is also free throughout Easter weekend (April 19 to 23). 445 North Park Avenue, Winter Park. 407-645-5311. morsemuseum.org. Cornell Fine Arts Museum. Located on the campus of Rollins College, the Cornell houses one of the oldest and most eclectic collections of fine art in Florida. Free tours take place at 1 p.m. on Saturdays at the on-campus facility, and at 1 p.m. on Sundays at the nearby Alfond Inn, which displays dozens of works from the museum’s Alfond Collection of Contemporary Art. Happy Hour tours of the Alfond Collection are also conducted on the first Wednesday of most months at 5:30 p.m. If you prefer historic works, Throwback Thursday tours are offered at the museum from 12:30 to 1:30 p.m. on the third Thursday of most months. Opening May 23 is Mexican Modernity: 20th-Century Paintings from the Zapanta Collection, a study of Mexico’s cultural landscape. The earliest works reflect Mexico’s indigenous past and draw inspiration from tradition, while later pieces document its evolution from agrarian to industrial with a focus on the country’s global role. Mexican Modernity closes September 8. Continuing through May 12 are two exhibitions: De La Torre Brothers: Rococolab, the collaborative work of artists-brothers Einar and Jamex de la Torre, whose complex baroque-inspired sculptures and “lenticulars” — those accordion-pleated pictures that show different images when viewed from the left or the right — are a reflection of their bicultural experience living in Mexico and Southern California; and The Place as Metaphor: Collection Conversations, works from the permanent collection that illustrate the notion of “place” in its varied definitions, from geographic locations to historical moments. Ruptures and Remnants: Selections from the Permanent Collection offers material manifestations, from antiquity to the present day, of ruptures ranging from personal crises to nation-state upheavals. Works periodically rotate through this long-term exhibition, which continues through December 31, 2020. Admission is free, courtesy of PNC Financial Services Group. 1000 Holt Avenue, Winter Park. 407-646-2526. rollins.edu/cfam. Crealdé School of Art. Established in 1975, this not-for-profit arts organization on Winter Park’s east side offers year-round visual-arts classes for all ages taught by more than 40 working artists. Admission to the school’s galleries is free, although there are fees for art classes. Ongoing through April 27 is Hand in Hand: The Creative Works of Janvier Miller and Gustaf Miller, which spotlights the duo’s most recent paintings, sculptures and ceramics. And through May 18 is Keepers of Heritage: Puerto Rican Artists in Central Florida, an exhibition of works by a collective of contemporary artists honoring their cultural roots. 600 Saint Andrews Boulevard, Winter Park. 407-671-1886. crealde.org. Hannibal Square Heritage Center. Established in 2007 by the Crealdé School of Art in partnership with residents of Hannibal Square and the City of Winter Park, the center celebrates the city’s historically African-American west side with archival photographs, original artwork and oral histories from longtime residents that are together known as the Heritage Collection. Admission is free. An ongoing exhibition, the Hannibal Square Timeline, documents significant local and national events in African-American history since the Emancipation Proclamation. The center offers a walking tour of Hannibal Square, Now and Then, with Fairolyn Livingston, the center’s chief historian. The tour, offered the third Saturday of each month from 10 to 11:30 a.m., requires reservations; the cost is $10, or $5 for those with student IDs. Historic sites include Mount Moriah Missionary Baptist Church, the Welbourne Avenue Nursery & Kindergarten and the Masonic Lodge, all built in the 1920s. 642 West New England Avenue, Winter Park. 407-539-2680. hannibalsquareheritagecenter.org. Annie Russell Theatre. “The Annie,” in continuous operation on the campus of Rollins College since 1932, concludes its 2018-19 season with Neil Simon’s Sweet Charity, the story of a hopelessly romantic but comically unfortunate dance-hall hostess in New York City. The groovy ’60s score includes “Big Spender” and “If My Friends Could See Me Now.” Curtain time for the show, which runs for eight performances from April 19 through 27, is 8 p.m., 4 p.m. or 2 p.m., depending upon the day of the week. Tickets are $20. 1000 Holt Avenue, Winter Park. 407-646-2145. rollins.edu/annie-russell-theatre. Winter Park Playhouse. Winter Park’s only professional, not-for-profit theater continues its 2018-19 mainstage season with the musical What a Glorious Feeling – The Story of Singin’ in the Rain, which closes April 13 and tells the little-known story of a love triangle behind the scenes of the iconic film. Next up is Heartbeats, which runs May 10 through 19 and May 30 through June 9. Making its Central Florida premiere, the contemporary musical follows a woman’s journey toward self-discovery as she nears her 40th birthday and 20th wedding anniversary. The Amanda McBroom score features “The Rose,” which was a hit for everyone from Bette Midler to Conway Twitty. Performances of both shows are Thursdays through Sundays, with evening performances at 7:30 p.m. and matinees at 2 p.m. Tickets range in price from $15 for students to $42 for evening shows. Meanwhile, the theater’s Spotlight Cabaret Series continues with performances by Marina Jurica on April 24 and 25. General admission is $20 plus a one-drink minimum (with $10 standing-room-only tickets available once general seating is sold out). 711 Orange Avenue, Winter Park. 407-645-0145. winterparkplayhouse.org. Florida Film Festival. Now in its 28th year, this Oscar-qualifying event draws about 180 independent feature films, documentaries, shorts and animated movies from across the U.S. and worldwide. The 10-day extravaganza will take place April 12 to 21, primarily on the grounds of the Enzian, a single-screen art-film house nestled in a three-acre, oak-shaded Maitland enclave with an outdoor restaurant and bar. (Some films will be shown at the Regal Cinemas megaplex in Winter Park Village.) Both single tickets and packages for festival events are available. 1300 South Orlando Avenue, Maitland. 407-629-1088. floridafilmfestival.com. Hannibal Square Heritage Center Folk & Urban Art Festival. This annual festival, now in its 10th year, celebrates culture and diversity through art and music. More than 25 Florida artists will offer their works for sale from 10 a.m. to 4 p.m. on April 27. The event includes live music, arts-and-crafts demonstrations, a soul-food truck and a Puerto Rican vejigante mask-making workshop for children that culminates in a public parade. Admission is free. 642 West New England Avenue. hannibalsquareheritagecenter.org. Enzian. This cozy, nonprofit alternative cinema offers a plethora of film series. Tickets are usually $12 for regular admission; $10 for matinees, students, seniors and military (with ID); and $9.50 for Enzian Film Society members. But children under age 12 are admitted free to Peanut Butter Matinee Family Films, shown the fourth Sunday of each month at noon. Coming up are Cloudy with a Chance of Meatballs (April 24), Time Bandits (May 26) and Mrs. Doubtfire (June 30). Saturday Matinee Classics, shown the second Saturday of each month at noon, will include Tokyo Story (May 11) and All About Eve (June 8). Cult Classics, shown the second and last Tuesday of each month at 9:30 p.m., has Fight Club (April 9) on deck. FilmSlam, which spotlights Florida-made short films, takes place most months on the first or second Sunday at 1 p.m.; the next scheduled dates are May 5 and June 9. Other series include Music Mondays, presenting music documentaries and filmed concerts, and Midnight Movies, which features envelope-pushing classics and cutting-edge new releases. Other special screenings will be held on Easter Sunday (along with an Easter egg hunt and delicious buffet luncheon), as well as on Mother’s Day and Father’s Day (paired with brunch and barbecue, respectively). 1300 South Orlando Avenue, Maitland. 407-629-0054 (information line), 407-629-1088 (theater offices). enzian.org. Friday Brown Bag Matinees. The Charles Hosmer Morse Museum of American Art presents three film series each year on topics related to the museum’s collection and art in general. Admission is free to these lunchtime screenings, which span the noon hour on select Fridays in the Jeannette G. and Hugh F. McKean Pavilion on Canton Avenue, just behind the Morse. Attendees are invited to bring their own lunches; the museum provides soft drinks and themed refreshments. 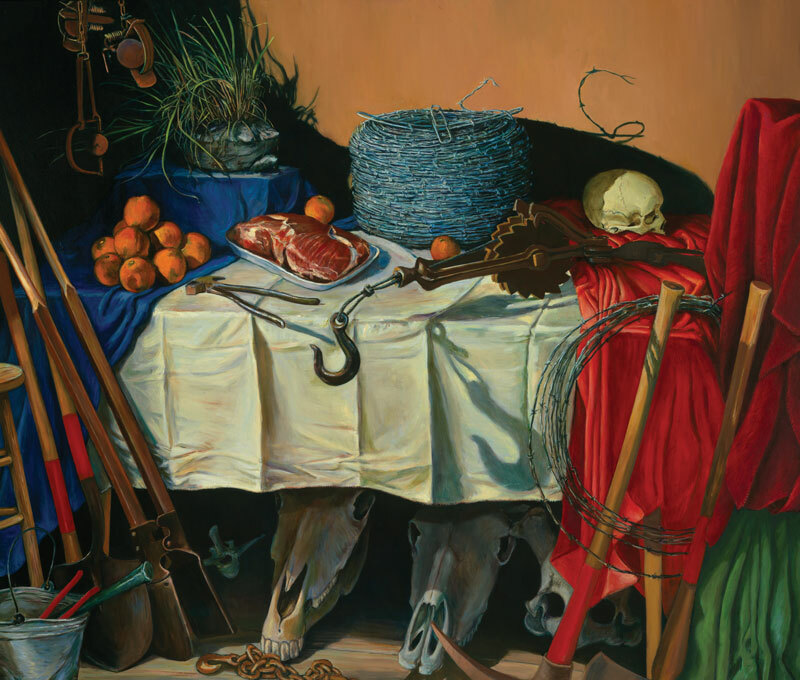 The four-part Spring Series, Northern European Art, explores the lives and works of artists from Belgium and the Netherlands in the 19th and 20th centuries. It kicks off April 5 with High Art of the Low Countries: Daydreams and Nightmares, a documentary that explores the psychology and social history of the region, which despite its small size produced some of the era’s most important and innovative artists. Three of the greatest will be profiled in the weeks to come with the documentaries Van Gogh: Painted with Words (April 12), In Mondrian’s Studio (April 19) and René Magritte: The Man in the Hat (April 26). 161 West Canton Avenue. 407-645-5311. morsemuseum.org. Popcorn Flicks in the Park. The City of Winter Park and Enzian collaborate to offer classic, family-friendly films free in Central Park on Park Avenue. These outdoor screenings are on the second Thursday of each month and start at 8 p.m. Upcoming films include Bill and Ted’s Excellent Adventure (April 11), Batman: Mask of the Phantasm (May 9) and Apollo 13 (June 13). Bring a snack plus a blanket or chairs. 407-629-1088. enzian.org. Screen on the Green. The City of Maitland offers free outdoor movies each fall and spring on the field at Maitland Middle School. Bring a snack plus a blanket or chairs. 1901 Choctaw Trail, Maitland. 407-539-0042. itsmymaitland.org. Casa Feliz Historic Home Museum. This stunningly restored Spanish farmhouse-style home, designed by acclaimed architect James Gamble Rogers II, is now a community center and museum. Free open houses are hosted by docents on Tuesdays and Thursdays from 10 a.m. to noon. Also, live music is featured in the large downstairs parlor most Sundays from noon to 3 p.m. (see “Music”). 656 North Park Avenue (adjacent to the Winter Park Golf Course), Winter Park. 407-628-8200. casafeliz.us. Holocaust Memorial Resource & Education Center of Florida. The center is dedicated to combating anti-Semitism, racism and prejudice, with the goal of developing a moral and just community through educational and cultural programs. It houses permanent and temporary exhibitions, archives and a research library. The museum’s ongoing exhibition, Tribute to the Holocaust, is a presentation of artifacts, videos, text, photographs and other works of art. Admission to the center is free. 851 North Maitland Avenue, Maitland. 407-628-0555. holocaustedu.org. Winter Park History Museum. Ongoing displays include artifacts dating from the city’s beginnings as a New England-style resort in the 1880s. Its current exhibition is Wish You Were Here: The Hotels & Motels of Winter Park, which will run through June 6, 2020. (For more, see page 14.) Admission is free. 200 West New England Avenue, Winter Park. 407-644-2330. wphistory.org. Zora Neale Hurston National Museum of Fine Arts. Eatonville is strongly associated with Harlem Renaissance writer and folklorist Zora Neale Hurston, who lived there as a girl and recorded her childhood memories in her classic autobiography, Dust Tracks on a Road. The museum that bears her name provides information about the historic city and sponsors exhibitions featuring the works of African-American artists and is an integral part of the annual, weeklong Zora! Festival each January. The current exhibition is Zora Neale Hurston’s “Native Village:” Historic Eatonville Remembered – Autobiography, Folklore, Literature. Admission is free, though group tours require a reservation and are charged a fee. 227 East Kennedy Boulevard, Eatonville. 407-647-3188. preserveeatonville.org, zorafestival.org, hurstonmuseum.org. 65th Annual Winter Park Easter Egg Hunt. A Winter Park tradition dating back to President Eisenhower’s first term in office, the hunt is held the day before Easter — this year, that’s Saturday, April 20. More than 10,000 eggs are hidden in north Central Park, where several hundred children usually show up to try and find them. (Participants are asked to bring their own baskets.) The fun begins at 10 a.m., with kids age 10 and under allowed to begin lining up at 9:30 a.m. Children with special needs are encouraged to participate. As always, every child will leave with an Easter egg. New this year is an “Easter Kids Zone,” which will open when the egg hunt concludes. Corner of New York Avenue and Morse Boulevard. 407-599-3334. cityofwinterpark.org. Earth Day in the Park. This free, fun-filled event in Hannibal Square’s Shady Park features a kids’ zone with games, tie-dye T-shirts, do-it-yourself art with help from the Crealdé School of Art staffers, a “quick draw” art competition organized by the Albin Polasek Museum & Sculpture Gardens, live music all day, child and adult yoga (bring a mat) and composting and recycling education. Of course, there’ll be food and beverage vendors. The April 13 event (one week before the official Earth Day) starts at 11 a.m., but registration for the “quick draw” competition begins at 9 a.m. for a 10 a.m. start. Certified arborists from Winter Park’s Urban Forestry Division will give away young trees in one-gallon containers for city residents to plant at home. Pennsylvania Avenue at New England Avenue. 407-599-3364. cityofwinterpark.org/earthday. Memorial Day Service. The ceremony in Winter Park’s Glen Haven Memorial Park cemetery usually includes an honor guard, music and a guest speaker. May 27 at 11 a.m. Admission is free. 2300 Temple Drive. 407-647-1100. cityofwinterpark.org. Winter Park Institute at Rollins College. Each year, the institute presents lectures, readings and seminars by thought leaders in an array of disciplines. The final lecture of the 2018-19 season, on April 11, features preeminent global conservation scientist Dr. M. Sanjayan, CEO of Conservation International and a member of the National Geographic Society’s Explorer Council. His program, Stories from the Natural World, starts at 7:30 p.m. in Bush Auditorium. Tickets are $25. 1000 Holt Avenue, Winter Park. 407-646-2145. rollins.edu/wpitickets. University Club of Winter Park. Nestled among the oaks and palms at the north end of Park Avenue’s downtown shopping district — a block beyond Casa Feliz — is another historic James Gamble Rogers II building, this one home to the University Club of Winter Park. Members are dedicated to the enjoyment of intellectual activities and socializing with one another. The club’s various activities, including lectures, are open to the public, although nonmembers are asked to donate a $5 activity fee each time they attend. (Some events include a buffet lunch for an added fee.) Check the club’s website for the next lecture or special event. 841 North Park Avenue. 407-644-6149. uclubwp.org. Maitland Farmers’ Market. This year-round, open-air market — held each Sunday from 9 a.m. to 2 p.m. — features fresh produce, seafood, breads and cheeses as well as plants, all-natural skin-care products and live music by Performing Arts of Maitland. The setting on Lake Lily boasts a boardwalk, jogging trails, a playground and picnic areas. 701 Lake Lily Drive, Maitland. itsmymaitland.com. Winter Park Farmers’ Market. The region’s busiest and arguably most popular farmers’ market is held every Saturday from 7 a.m. to 1 p.m. at the old railroad depot, which also houses the Winter Park History Museum. The open-air market offers baked goods, produce, plants, honey, cheese, meat, flowers, crafts and other specialty items. After shopping, make a morning of it with a stroll along nearby Park Avenue. Dogs are welcome to bring their people. 200 West New England Avenue, Winter Park. cityofwinterpark.org. Bach Festival Society of Winter Park. The society’s 2018-19 season begins winding down April 14 when the society hosts acclaimed pianist Richard Goode in Tiedtke Concert Hall on the Rollins College campus. The program, which starts at 7:30 p.m., will feature works by Haydn, Beethoven and Chopin. The season closes April 27 and 28 with the final installment of the society’s Choral Masterworks series, Power of Romanticism and Resurrection. With music from the French romantic period, the concert includes Seven Last Words of Christ by Théodore Dubois, Sanctus by Charles Gounod and Psalm 150 by César Franck. Performances are 7:30 p.m. on Saturday and 3 p.m. on Sunday in Knowles Memorial Chapel, also on the Rollins campus. Tickets range in price from $25 to $99. 1000 Holt Avenue. 407-646-2182. bachfestivalflorida.org. Blue Bamboo Center for the Arts. This eclectic venue is part concert hall, part recording studio and part art gallery. It offers live performances most evenings, with an emphasis on jazz, classical and world music — although theater, dance and spoken-word presentations are sometimes on the schedule. Admission generally ranges from free to $25. Just a few of the upcoming performers are: The Steve Luciano Trio (April 18, 8 p.m.), Alexis Cole (May 18, 8 p.m.) and Chris Cortez and Bobby Koelble (June 25, 8 p.m.). 1905 Kentucky Avenue, Winter Park. 407-636-9951. bluebambooartcenter.com. Central Florida Folk. This Winter Park-based not-for-profit is dedicated to promoting and preserving live folk music, primarily through concerts usually held on the last Sunday of each month (unless a holiday intervenes). The group’s primary venue is the Winter Park Public Library, 460 East New England Avenue, Winter Park. Upcoming concerts are: Bernice Lewis plus Laura Rabell (April 28), 2 p.m. plus Mike Worrall (May 19) and Michael Reno Harrell (June 30). Performances start at 2 p.m. A donation of $15 for nonmembers is suggested. 407-679-6426. cffolk.org. Dexter’s of Winter Park. This well-known restaurant in Winter Park’s Hannibal Square district occasionally has live musical acts with no cover charge. Upcoming performances include Midnight Mayhem (April 5, 8:45 p.m.), Eden Lane (April 6, 8:30 p.m.) and Thomas Wynn (April 9 and 16, 6 p.m.). 558 West New England Avenue, Winter Park. 407-629-1150. dextersorlando.com. Get Your Jazz On. The Alfond Inn continues its concert series on April 26 with live jazz under the stars that includes not only music but roasted pig (and a vegetarian alternative), wine, beer, seasonal cocktails and even cigars. The outdoor event (which moves indoors if it rains) runs from 6:30 to 9:30 p.m. Tickets are $50 in advance, with valet parking included. Alfond Inn, 300 East New England Avenue, Winter Park. 407-998-8090. thealfondinn.com. Music at the Casa. The Casa Feliz Historic Home Museum presents free acoustic performances most Sunday afternoons from noon to 3 p.m. in the museum’s cozy main parlor. Upcoming performances include: violinist Amy Xaychaleune (April 7), Aleksandra Vargas (April 14), saxophonist Matt Festa (April 28), selections by Beautiful Music (May 5), guitarist Alejandro Rowinsky (May 12), harpist Victoria Schultz (May 19), violinist Lisa Ferrigno (June 2) and flamenco dancers Ernesto and Jenny Caballero (June 9). 656 North Park Avenue (adjacent to the Winter Park Golf Course), Winter Park. 407-628-8200. casafeliz.us. Opera Orlando on the Town. Experience an immersive re-telling of the story of Noah’s Ark through incredible singing, exciting orchestration and stunning pageantry. Opera Orlando’s Youth Company stars in this production of Benjamin Britten’s Noye’s Fludde, based upon the “miracle” plays of 15th-century England. Performances are May 18 and 19 (7:30 p.m. and 2 p.m., respectively) at St. John Lutheran Church. Tickets are $25.75 for adults; $10.30 for youths. 1600 Orlando Avenue, Winter Park. 407-512-1900. operaorlando.org. 18th Annual Dinner on the Avenue. The city supplies the tables, chairs, white linen tablecloths and, of course, the outdoor setting while you and your friends, family or co-workers supply fellowship and clever conversation while dining in the middle of closed-off Park Avenue opposite Central Park. The annual event is also a friendly competition, with awards for table decorations in such categories as “Most Colorful,” “Most Elegant” and “Most Original.” This year’s April 6 event, already sold out at $125 a table, is from 6 to 10 p.m. 407-599-3334. cityofwinterpark.org. 34th Annual Taste of Winter Park. Sample all the best food that Winter Park has to offer on April 17 from 5 to 8 p.m. More than 40 of Central Florida’s top chefs, caterers, bakers, brewers, vintners and confectioners bring their best noshes and beverages to “Winter Park’s ultimate foodie festival.” Tickets range in price from $50 to $65. Winter Park Farmers’ Market, 200 West New England Avenue. 407-599-3580. winterpark.org/taste-of-winter-park. Wine at Nine. Raise a glass on National Wine Day (more commonly known as May 25), when the Winter Park Golf Course and Parks Department team up to host this fun-filled new event. From 3 to 6 p.m., try a different type of wine at each hole along the course and munch on perfectly paired snacks. Check the city’s website for ticket prices and more information. Winter Park Golf Course, 761 Old England Avenue, Winter Park. 407-599-3342. cityofwinterpark.org. Winter Park Garden Club. Since its founding in 1922, the club’s general membership meetings always offer something intriguing for lovers of gardening and the great outdoors. Its April 10 meeting, which starts at 10 a.m., is a fun and informative Environmental Trivia Game led by Mary Dipboye, who’ll preside over the game and discuss current environmental issues and legislation. Admission is free. On April 11, also at 10 a.m., the club hosts a Fun with Flowers Workshop, during which attendees will create spring flower arrangements. Cost is $25; everything is supplied — but bring your own clippers. On April 18, the club will host a walking tour of the Central Florida Zoo and Botanical Gardens. Cost is $13, or $12 for those age 60-plus. Finally, the club’s annual luncheon is set for May 9 at 11 a.m. at Interlachen Country Club. Cost is $25. All other events are at the club’s headquarters at 1300 South Denning Drive. 407-644-5770. winterparkgardenclub.com. Florida Writers Association. The Orlando/Winter Park-Area Chapter meets the first Wednesday of each month from 6:30 to 8:30 p.m. for guest speakers and discussions organized by author Rik Feeney. Upcoming events are slated for April 3, May 1 and June 5 at the University Club of Winter Park, 841 North Park Avenue, Winter Park. Another chapter, the Maitland Writers Group, meets the second Thursday of each month from 6:30 to 8:30 p.m. for speakers and discussions organized by author Nylda Dieppa-Aldarondo. Upcoming events are slated for April 11, May 9 and June 13 at the Maitland Public Library. 501 South Maitland Avenue, Maitland. floridawriters.net. Wednesday Open Words. One of the area’s longest-running open-mic poetry nights happens every Wednesday at 9 p.m. at Austin’s Coffee, 929 West Fairbanks Avenue, Winter Park. The free readings are hosted by Curtis Meyer. 407-975-3364. austinscoffee.com. Work in Progress: A Group for Writers. This monthly discussion group is for writers in any genre who offer and receive feedback from their peers. Guest speakers are often invited to monthly meetings, which are held from September through May. Upcoming dates include April 13 and May 4, from 1 to 2:30 p.m. Those planning to read their works aloud should register with organizer and host Gerald Schiffhorst, a University of Central Florida professor emeritus of English, by emailing schiffhorst@yahoo.com. Conference Room, Winter Park Public Library, 460 East New England Avenue, Winter Park. wppl.org. Writers of Central Florida or Thereabouts. This group offers various free programs that attract writers of all stripes. Short Attention Span Storytelling Hour ... or Thereabouts, a literary open-mic night, meets the second Wednesday of most months at 7 p.m. at Stardust Video & Coffee; it’s for authors, poets, filmmakers, comedians, musicians, bloggers and others. Upcoming meet-ups include April 10, May 8 and June 12. 1842 Winter Park Road, Winter Park. Orlando WordLab, a new program that combines the old Writers Roundtable and So You Think You Can Funny?, meets the fourth Wednesday of each month at the Winter Park Public Library starting at 7 p.m.; upcoming dates include April 24, May 22 and June 26. 460 East New England Avenue, Winter Park. stardustvideoandcoffee.wordpress.com, wppl.org, meetup.com/writers-of-central-florida-or-thereabouts. Good Morning Winter Park. Hosted by the Winter Park Chamber of Commerce, these monthly gatherings attract business- and civic-minded locals who enjoy coffee and conversation about community issues. Scheduled for the second Friday of most months, upcoming dates include April 12, May 10 and June 14. Networking begins at 8 a.m. followed by a 45-minute program at 8:30 a.m. Admission, which includes a complimentary continental breakfast, is free. Winter Park Welcome Center, 151 West Lyman Avenue, Winter Park. 407-644-8281. winterpark.org. Hot Seat Academy. Hosted by the Winter Park Chamber of Commerce, this quarterly business-oriented series puts local executives in the spotlight as they offer advice and discuss entrepreneurism, leadership and sales-and-marketing techniques. The next scheduled gathering is May 22 from 11:30 a.m. to 1 p.m.; check the chamber website for the featured speaker. Tickets are $10 for members, $15 for nonmembers. Reservations are required. Winter Park Welcome Center, 151 West Lyman Avenue, Winter Park. 407-644-8281. winterpark.org. Winter Park Executive Women. Hosted by the Winter Park Chamber of Commerce, these gatherings — held the first Monday of most months from 11:30 a.m. to 1 p.m. — feature guest speakers and provide networking opportunities for women business owners. Topics revolve around leadership development, business growth and local initiatives of special interest to women. Upcoming dates include April 1, May 6 and June 3. Tickets, which include lunch, are $25 for members and $50 for nonmembers. Reservations are required. Winter Park Welcome Center, 151 West Lyman Avenue, Winter Park. 407-644-8281. winterpark.org. Baby Owl Shower. Brace yourself for one of the cutest events of the year — the impending birth of baby owls. Each year the Audubon Center for Birds of Prey (which focuses on the rescue, rehabilitation and release of Florida’s raptors, such as bald eagles, ospreys, owls and falcons) throws a Baby Owl Shower as a fundraiser to help cover the facility’s increased costs during baby-bird season. That means a day of fun and educational activities for the whole family, and non-releasable baby raptors will be available to view. This year’s shower, on May 11 from 10 a.m. to 2 p.m., is free if you bring an item from the center’s online wish list. 1101 Audubon Way, Maitland. 407-644-0190. fl.audubon.org. Run for the Trees: Jeannette Genius McKean Memorial 5K. This popular foot race, held this year on April 27 at 7:30 a.m., begins at Showalter Field, 2525 Cady Way. But the last mile and the finish are through the privately owned Genius Preserve, which is open to the public only for this annual event. Shuttle buses return runners to the starting line and parking lot; all finishers receive a young tree to plant. Registration, which ranges from $33 to $40 per person, is limited to 1,800 people. Proceeds support the Winter Park Tree Replacement Fund. 407-896-1160. trackshack.com. Watershed Cleanup. Keep Winter Park Beautiful is seeking volunteers to help clean up lakes Mizell, Sylvan and Osceola. The April 6 project, which runs from 8 to 11 a.m., involves picking up litter in and around the lakes. Kayakers and paddle-boarders are welcome. Volunteers are asked to meet at Dinky Dock Park (410 Ollie Avenue); there they’ll be provided with breakfast, a T-shirt, snacks and water. The city will also supply litter grabbers, safety vests, gloves and garbage bags. Participants are urged to carpool, bring a reusable water bottle and wear closed-toe shoes plus a hat and long pants. 407-599-3364. To register for this free event, visit cityofwinterpark.eventbrite.com.